Everyone knows of his infamous theory of relativity and his hand in creating the atomic bomb. What you may not know about is his status as a refugee seeking asylum in Princeton, New Jersey as World War II ravaged his homeland. Born in Ulm, Germany in 1879, Einstein is considered the most influential physicist of the 20th century. He renounced his German citizenship in 1896, as he found the schooling and opportunities of Switzerland more to his liking. There, he began work on his theoretical work on the nature of relativity. By 1914, though, Einstein had returned to Germany to work as a professor at the University of Berlin. It was there that he earned the 1921 Nobel Peace Prize in physics for his explanation of the photoelectric effect, in which the increased frequency of light waves causes increased kinetic energy in the resulting photoelectrons. A mere 12 years later, Adolf Hitler began his meteoric rise to power in Germany. Because of his fame and influence on the world of science, and his status as a Jewish man, Einstein quickly became the target of anti-semitic attacks. He fled Germany with his wife, accepting a research position at the Institute for Advanced Study in Princeton, New Jersey in 1932. 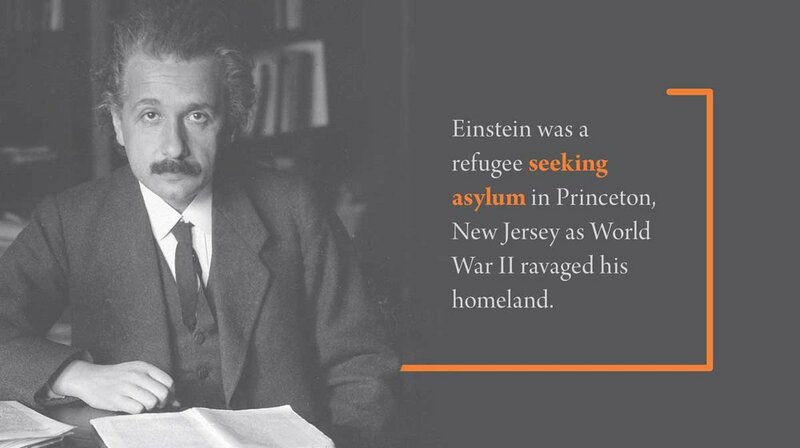 Einstein became a refugee in the care of the United States during a time of deep turmoil in a continent on the precipice of war. Einstein took to life in America quickly, embracing the challenges and opportunities that were available to him outside of Germany. By 1935, he was granted a permanent residency. In 1939, he co-wrote a letter, famously referred to as the Einstein-Szilard letter, detailing the capabilities of the hydrogen bomb in the battle against Germany. In the letter, he explains that Germany might be in the process of developing their own bombs, and that America would do well to begin their own program. This letter prompted the development of the Manhattan project, a program that ran from 1942-1947 during which the United States, the United Kingdom, and Canada worked together to develop weapons of mass destruction to use against enemies of democracy and freedom. In 1940, he passed his citizenship test and became an American citizen. To commemorate the occasion, he gave a speech on the government-run “I Am An American” radio show, which worked to promote the inclusion of immigrants. According to NPR, the program “featured ‘distinguished naturalized citizens’ who were brought on to talk about their citizenship and remind the country of the ‘possession which we ourselves take for granted but which is still new and thrilling’ to those who recently acquired it.” This program was quite radical in a time where an “us-vs-them” mentality was very prominent as World War II raged on. When Einstein heard the news that the atomic bomb had been dropped on Hiroshima, he quickly rallied together an international effort to bring nuclear weaponry efforts under the control of the United Nations, to act as a deterrent against further coups by hostile nations. At the same time, he joined the NAACP, working with W.E.B Du Bois to promote civil rights for people of color. Einstein lived out his final years in relative isolation from the rest of the physics community. As others moved forth into researching atoms and particle physics, he was still deeply enamored with the idea of relativity, spending his time theorizing on wormholes, the creation of the universe, time travel, and black holes. During this time, he continued his work through the NAACP. On April 17, 1955, suffered from an abdominal aneurysm. He adamantly refused life-saving surgery, content in his accomplishments. “I want to go when I want,” he said. “It is tasteless to prolong life artificially. I have done my share, it is time to go. I will do it elegantly.” Einstein passed away the next morning. Albert Einstein came to America seeking refuge from a country torn apart by the ravages of war. In exchange for this asylum, he offered his brilliance and ingenuity, changing the world of physics forever. Without Einstein, one can only imagine the destruction that Germany’s nuclear program would have brought forth on the world. One last note: At the World’s Fair in 1940, Einstein gave a speech touting the merits of immigration to America. That’s a notion we can get behind. Newer PostJust how Vital are Immigrants to the American Workforce? Older PostImmigration: Burdensome or a Boon to Our Economic Future?